Australia is a great place to study. It provides high-quality courses, a fantastic lifestyle and a welcoming environment for international students. Once you have been accepted into your Australian course, the next step is to organise your student visa. Before you apply for an Australian course, you should contact the Department of Immigration and Border Protection (DIBP) or your nearest Australian visa office to find out whether you will be eligible for a student visa, how to make your application and what documents are required. proving that you are a genuine temporary entrant. You need a Confirmation of Enrolment (CoE) from your education provider to apply for your student visa. Letters of offer are no longer accepted, even at the application stage. Applications are typically lodged online, although you may be able to apply by post or in person at your designated Australian visa office. The amount of evidence you are required to provide with your application will depend on your country of origin and intended education provider. You can use the document checklist tool on the DIBP website for an indication of the evidence you will need to submit. The best way to find out your specific visa requirements is to visit the DIBP website. You can also contact an education agent, your nearest Australian visa office or the international office at your intended Australian institution for advice and help with your visa application. Students can apply for two or more courses on the same student visa when there is clear progression from one course to the next. The final course a student undertakes is classified as their main (or principal) course of study and is used to determine evidentiary requirements. 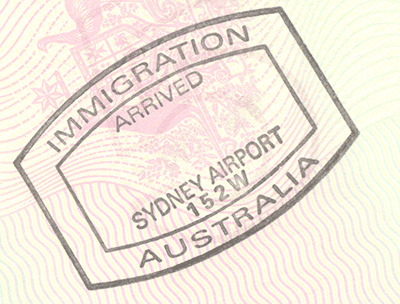 A non-refundable base application charge of approximately AUD$575 applies to most visa applications. Applicants who are bringing eligible family members to live with them in Australia while they study should note that an additional applicant charge applies for each additional family member included in a combined visa application. This charge is added to the base application charge and varies according to the age of the additional applicant(s). In addition, there may be other expenses associated with your visa application, such as costs for medical examinations, police checks and the translation of documents into English (if required). For more information, see the Fees and Charges section of the DIBP website. If you are the parent or legal guardian of a child under 18 who is moving to Australia to study, you can also apply for permission to live in Australia as a student guardian on a Student Guardian Visa. Student guardians can live in Australia for the duration of their child's course or until the child turns 18. There may also be exceptional circumstances where a student over 18 years of age may need a guardian for religious or cultural reasons. The Department of Immigration and Border Protection can provide more details about eligibility and the application process. Visit the Student Guardians section of their website for more information. The best way to find out your specific visa requirements is to visit the DIBP website or your nearest Australian visa office. You can also contact an education agent or the international office at your intended Australian education provider for advice and help with your visa application.